At Bellissimo! 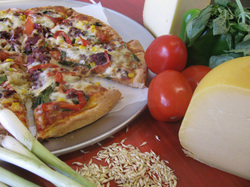 we combine our love of delicious, healthy pizza with our passion for using fresh local ingredients whenever possible. Our home-made tomato sauce starts with fresh tomatoes, sourced in season from Kelowna farms, as are almost all our fresh veggies, and even our walnuts. Our Gouda for our Mozza / Gouda cheese blend comes from Triple Island Farm between Lumby and Cherryville, our “BC Bud’s” pearl garlic is grown in Vernon and when we can we buy our chicken from literally just down the road. We even buy Okanagan flour for our home-made white/whole wheat blend thin crusts. During the winter months we work with local wholesalers to try and buy as much produce as possible from within BC.